Ace Von Johnson is a guitarist who has been touring the world for the last 10 years, most recently with the glam metal and punk band, ‘Faster Pussycat’. 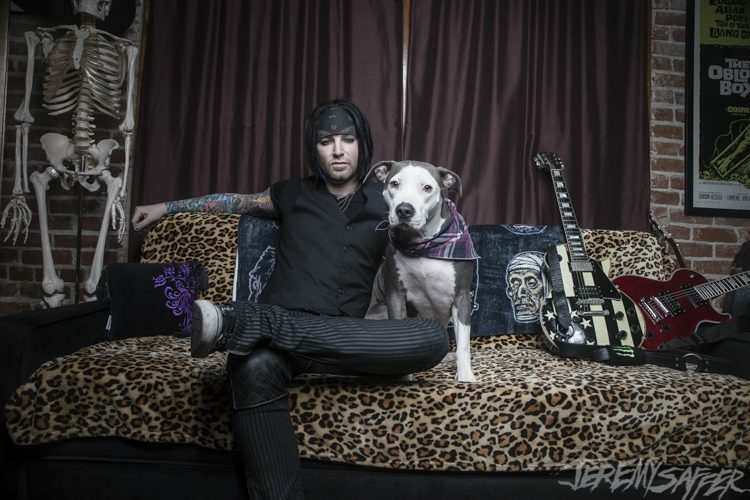 When we found the guitarist sharing stories about pit bulls and dogs down on their luck, we got in touch and asked him to tell us more about his own dog, Maila. Hi Ace! Thanks for making the time to speak with me while you’re on tour. We’ve seen the photos, so please tell us all about your dog. Hi! My dog's name is Maila (pronounced My-Luh), and she is a 4 year old rescue American Staffordshire Terrier, also known as a pit bull. How did you come to own her? I rescued her in late 2013 from a high kill shelter in the northern Los Angeles area. It was the same year my mother had passed away and I was feeling like I had a really huge hole in my life. I was in a position with my home and work life where, should I get a dog, I had a friend and somewhere for her to stay while I was away for work. That was a big factor into why I waited until I did to adopt. When I went into this shelter initially, it was to see another dog but we just didn't seem to click. I did, however, see Maila and she seemed to be quite peaceful despite her chaotic shelter environment. I left, but came back several times to see her again before asking to visit with her outside of her kennel. The woman who worked there brought her into a visiting stall, and she just sat at my feet and rested her head on my lap. All she could do was look up at me with her big hazel eyes, which seemed to tell me that I was going to be her human. She was clean and well mannered; almost like she had been someone's pet, but she had come in as a stray and had no chip or identification. They held her for the remainder of the mandatory holding period to allow any potential owners to claim her, and on the day before she could be adopted, I came by again. I asked if I could see her out in a larger environment, so they took us out to an enclosed yard area and we played fetch for a bit and she was still on her best behaviour. That's pretty much when I told them I would be back to pick her up the next morning. Wow, it sounds like it was all meant to be. What happened next? Unfortunately, I had several shows to do with a band I was playing with at the time and I had to make the difficult decision to bring her with me for a weekend of shows around Southern California, or if I wanted to leave it to chance and see if she'd be there when I returned. I knew I loved her, and I said "if she's going to be my dog, she has to get used to the rock 'n roll lifestyle anyhow", so off we went! Her first weekend with me, we were "on tour" and she did great. I got us dog friendly rooms everywhere and she attended all the sound checks and met everyone and was just wonderful. What's really special about her is that not only is she a perfect example of being a great dog but also truly my best friend. She's indicative of how great these types of dogs can be when shown love and compassion and has made me a better person for it. I'm a huge champion of the bully breeds and the plight of the pit bull in general and I definitely have her to thank for that. So, to say she is special is an understatement. I've had a dog for most of my life. My mother had a Cocker Spaniel-Poodle mix when I was very young and then after that, we had a Whippet. They were great dogs but they were her dogs, and not necessarily mine when it came to a connection. But I've always considered myself a dog person, nonetheless. I got my first pit bull when I was in my early 20s, by chance and have basically fallen in love with them increasingly ever since. How many nicknames does Maila have? Oh wow, nicknames a'plenty! Let's see... I'll have to start this and come back I'm sure. Moop, Moodle, Moosh, Moo, Moo-cow, Mooptle, Ma, Moo-Moo, Moo-Me, Princess-girl, Moödlehead, Doggle, Wigglebottomus and Smoosh. There’s probably another dozen but I just can't recall them until they slip out of my mouth. There is also a hefty list of mispronunciations of her name as well. I hear Malia often. And I've even heard as far off the mark as Malalia before. (Laughs) I started using the hashtag #pronouncedMyLuh on both of our Instagram pages hoping to curb that, but it hasn't helped much. Aside from when you first got her, does Maila go on tour with you regularly? Well aside from when I first got her, no. I keep "threatening" to bring her out with us on the road, and now that my singer has quit smoking, I would say it's highly likely. I’m even considering doing some type of meet-and-greet thing with her, where daily I could have a small amount of fans who come and have their photos taken, go out for a walk with her and get a signed picture and so on, and then we could donate the funds to some rescue groups. But at the moment, that's just an idea. Oh wow, that sounds like a great idea. What did you want to be growing up? Growing up, I wanted to be a myriad of things. The two careers that stuck with me the most were a stand up comedian and a veterinarian. Ironically, with my job I frequently feel like being onstage is quite akin to a comedic act and a lot of the people I work with are absolute animals. So, I kind of ended up in a grey area. I'm kidding of course, but I'm really glad that I can use what little bit of a notoriety I've got to help raise awareness for all kinds of rescues and draw positive attention to pit bulls alike. What’s the most rock'n'roll song about dogs that you know? (Thinks about it) The first songs that come to mind are 'I Wanna Be Your Dog' by Iggy & The Stooges and Nazareth’s 'Hair Of The Dog', although neither song is really about an actual dog! Do you have a song that’s a guilty pleasure? Just one? Lately it's been Pink Floyd's 'Comfortably Numb' but I suppose that's not too far off the mark for a rock musician. Mostly due to the lyrical content and those solos, followed up with my permanent answer; The Eagles 'Hotel California' for the same reasons -ambience, lyrics and guitar solos. Those two songs contain probably some of my favourite lead licks ever. They are great songs. What do you think dogs know that we as humans don't yet know? Compassion on a level that we aren't nearly capable of, in my opinion. And the same thing with absolute love. A dog will never look at you and pass judgment. They're only capable of loving you or fearing you. So, if all you show them is love then that's all they are going to reciprocate. Humans, not so much. So, what a truly wonderful feeling to only know love and not have any doubts! Beyond that, I think it's now been proven that they can see certain light spectrums that our eyes can't detect, which is fascinating. And I also believe they're able to see 'ghosts', if you're into that sort of thing. I can absolutely say that on this last American tour ‘Faster Pussycat’ did, I was up until 6, 7, 8 am, sometimes later - every single night, just reposting and retweeting posts about dogs in shelters across the world, trying to network for them and just help connect the dots. That's a big one for me. And when I'm not up worried about some pup somewhere, I'm dwelling on the current state of the world, especially with all that’s going on in our country. But that's all I'll say about that. Finish the following sentence: my dog is...an angel. I would be lying if I didn't say she has kept me alive on many occasions over the 4 years I've had her. She has been a best friend and a reason to get out of bed. My dog is the perfect example of how wonderful these dogs can be when shown love and properly socialised. And I am constantly humbled by her ability to act as an ambassador for pit bulls while on our walks through Hollywood, playing at the dog park or any other social opportunities she is presented with. From time to time, I'll notice people who try to avoid her based upon their own misconceptions, but when given the chance meet her, I'm happy that she is able to break those stereotypes. That's what my dog is. What do you think is the most important life lesson dogs can teach humans? How to be less judgmental and how to love unconditionally. I think dogs excel at both of these things and I wish we, as people would learn to take note. There was an issue recently with Maila. She was in a very serious fight with her longtime dog sitter’s dog, a male Boxer mix. They had been companions off and on for most of their lives, without any issues prior. When they were found, Maila was barely alive and both dogs were rushed to the nearest vet in Los Angeles. Maila’s wounds were so severe that she had to be triaged to a more equipped facility. There, she had to undergo an emergency surgery in order to save her life and she needed two immediate blood transfusions. She also went into cardiac arrest during this procedure, had some forty-plus puncture wounds to her neck, chest, face and legs, and had what was described as some of the worst muscle tissue damage they had ever seen. I was told they weren’t sure if she would survive. I was out of the country, travelling for work and wasn’t able to come back as I would have liked while all of this was happening. It was one of the most gut-wrenching feelings I have ever endured in my life, knowing that somewhere my best friend was injured, and in an indescribable amount of pain. She was very touch and go for the first 5 days, with the surgeon and staff calling me several times a day to keep me updated. One of the most frustrating parts was the time difference, me being roughly 9 hours ahead of her, and having to wait almost an entire day for my first phone call (noon for them, 8 or 9pm for me) and then having to force myself to stay awake sometimes from anywhere from 4 to 6 am, for my evening call. I had immediately considered flying home to see her, but the staff had advised she not have visitors. It was heartbreaking. By the end of the first week, she was more or less out of the woods, and with only a few days remaining of my tour, I chose to finish out my work obligations and would see her when I returned. She stayed in medical boarding at the West Los Angeles VCA Animal Hospital, where she had been taken from the beginning. She received the best treatment and care from their amazing staff, who really took a liking to her (how couldn’t you?) I was told that all of the staff continually doted on her, and found some solace in knowing that. Once I made this ordeal public, I started giving friends and fans daily updates via social media, as much as I could. I was sharing medical information, my feelings and the occasional photo I would get, just to keep everyone up to date. Although some of these photos I received during the worst of it were just too horrible to share. Several friends started fundraisers for us to help with her mounting medical bills (which reached well into the five figure mark) and towards any future care/needs she may require, which even as I say this, she still has at least two more procedures to go. I am still in complete shock at how many people donated to her cause but am beyond grateful nonetheless. I can't imagine how you felt being out of the country and all of this going on with your best friend. Ultimately, the help, love and overwhelming amount of support that we received from everyone far surpassed what I ever could have imagined and is what I believe got us through this. I had to have something to hold on to, because I was thousands of miles away, in foreign countries, with obligations that had to be met. I still had to get onstage every night and perform for a thousand or so people which at times, was so incredibly hard for me to focus on. Although I must say that at the last show of the tour, I could see two people in the front row wearing a Maila’s Pit-Pals shirt and definitely felt like I had everyone rooting for her. I can tell you that there were days where I cried for hours at a time, thinking I was going to lose her and then, later on, I was crying just at seeing how many people came to our aid. It was quite the emotional rollercoaster for well over a week. But once they finally called me and said she was going to make a solid recovery, it was definitely something for me to simply be thankful for, and how appropriate - because three days later I found myself flying home to Los Angeles on the Thanksgiving holiday. Although I don’t know if a 'happy ending' is how I would describe the end of this story, I am truly grateful that she survived and we were able to overcome this entire ordeal. Originally, her prognosis was that she would lose most of her muscle control in her left front leg and I was told 'she would never be the same'. The silver lining is that she can walk again and her wounds have all but healed up completely. And I am grateful for that. She has quite a few scars now, in what I can only describe as a Frankenstein-type appearance in some places, which I’m hoping with time, her fur will grow over. I suppose that's kind of cool, if I had to spin some positive light on it. I’ve been home now for 3 weeks, and she hasn’t left my side since. Hell, she’s been sitting here with her head on my lap this entire time. And in that short amount of time, I’ve watched her go from barely able to walk or play, hampered by her wounds, to being able to run and move about again, like a dog should. Maila is a strong-willed, yet sweet soul who loves everyone she meets and has never had to endure something like this before. Anyone who knows me knows how much I champion not only her but these types of dogs in general, and I would describe her as the definitive perfect dog. She is truly an ambassador for pit bulls everywhere. All I can say is that I honestly believe it was the outpouring of love that she received from everyone and the wonderful care from the people at VCA Animal Hospital that saved her. Plus I’m certain she could tell that she was still needed here and I’m willing to bet plenty of you reading this know exactly what I mean. And though I have no moral to end this with, I do hope that each of you hug your pups extra tight and never forget that they’re family too. Thanks so much Ace! We'll keep Maila's recovery in our thoughts, please keep us posted. This Dog Was Attacked With A Sword – But Now Look Him!